Tom Forrestall at Elliott Louis Gallery, Vancouver, B.C. 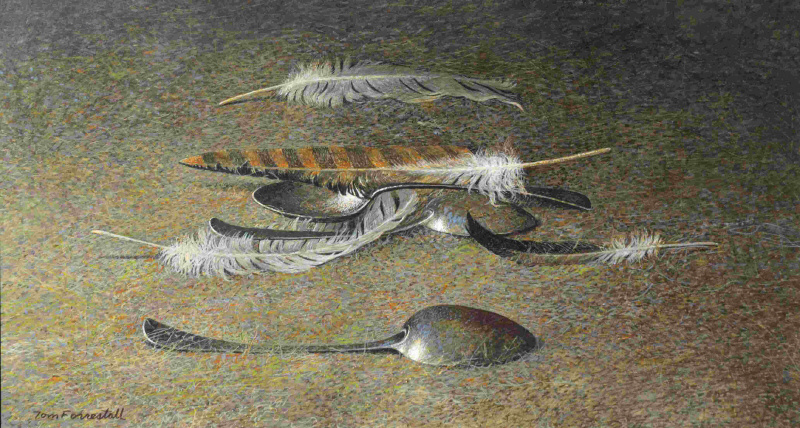 ‘Three Spoons Four feathers In Rust And Dirt’, Egg tempera Oct. 09. I started sprinkling on dots, dashes and line with ink and scratching it out. It did not convince me . . . so the studio floor was swept up and the hairs, dust bunnies, bits and dirt were spread out on a clean white sheet of paper. . . what a surprise of colours, shapes and other minute bits were there. They are the reference model used in this painting. The importance of dust, what could be more useless than dust, but yet as it lay over the spoons and feathers it was beautiful. It softened the light, knit the colours together and gave the overall a fuzzy look. Here again a subject has been returned to and seen anew. There is never anything boring about digging deeper and deeper into the familiar and seeing more and more in it. This is one of the many ways I paint. Also the intense focus on the here and now creative process excludes any former dealings with a vaguely similar subject. Tom Forrestall. Dartmouth N.S. Autumn’09. Elliott Louis (258 East 1st Avenue, Vancouver. B.C. Canada) is my local gallery – a friendly and welcoming space showcasing Vancouver, Canadian and international art. Until October 6, 2011, Elliott Louis is exhibiting Tom Forrestall – do not miss this show if you live in Vancouver. I was so very impressed by Tom’s work. If you really can’t make it at least watch the video and look at Tom’s work at the gallery’s website, but realize that the paintings really must be seen in person as on line they lose much of their magic. It was not only the paintings that enchanted me – Tom’s writings about his process, philosophy and life are so human, poetic and artistically enlightening. He actually writes on the back of his canvases, however; the gallery have transposed his words and placed them next to his paintings for all to read. This man is a Canadian master and this show may be the only chance to see his art on the West Coast. Vancouverites – take the time to go and see and read; you won’t regret it. Other Canadians – be aware and proud of this artist and his profound work. From the Elliott Louis gallery website: Tom Forrestall, who lives in Dartmouth, Nova Scotia and is now in his 75th year, is represented in virtually every major public collection in the Maritime Region, Central Canada and beyond, including solo exhibitions in prominent galleries worldwide. Forrestall is one of our four great “Atlantic Realist” painters, (the others being Mary Pratt, Christopher Pratt and Alex Colville). This is Mr. Forrestall’s first exhibition in Vancouver.